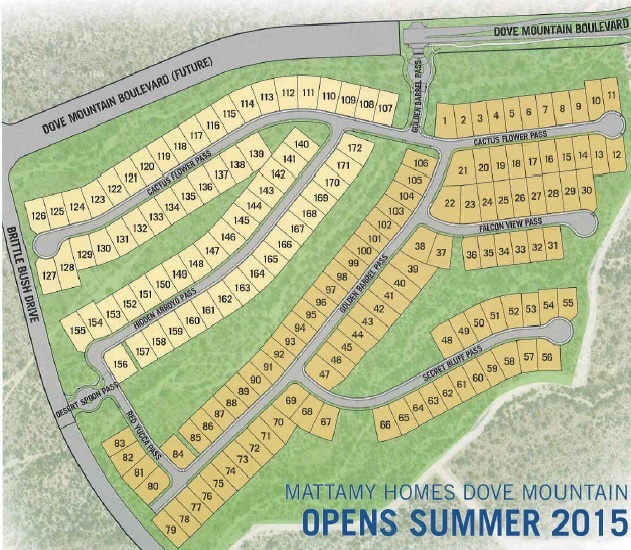 The Mattamy Dove Mountain subdivision of Golden Barrel Place will open in mid-July 2015. The Mattamy Dove Mountain subdivision is located just west of the Ritz Carlton “round about” to the west of the new Del Webb At Dove Mountain subdivision. Mattamy Homes at Dove Mountain will have 172 home sites ready for the 9 great room floor plans Mattamy Homes will build. There will be two series of Mattamy Homes floor plans – The Scenic series and the Peak Series. The Scenic Series will offer floor plans from 1,896 SF to just over 2,700 SF. The larger Peak Series will have 4-floor plans ranging from 2,762 SF to 3,277 SF. Pricing on Mattamy Homes Dove Mountain and lot premiums have not been released. This new Dove Mountain community will be gated and offer open areas of the Sonoran Desert throughout the community. Many home sites will have views of theCatalina Mountains, Tucson Mountains or Tortolita Mountains. The layout of the gated Mattamy Dove Mountain Subdivision is designed to offer homeowners a quiet setting with mountain and desert landscape views. The layout of this new Dove Mountain Subdivision shows the lots for the Peak series floor plans in light tan and the Scenic Series floor plans in darker tan – BELOW. Each Mattamy Homes Dove Mountain Floor Plans will offer many standard features and upgrade options to create your home in Dove Mountain. Mattamy Homes is a privately-held new home builder based in Toronto Canada. Mattamy Homes has been building homes since 1978 and is a prominent builder across. Mattamy Homes has built over 60,000 homes in Canada through 2015. Many Canadians are familiar with Mattamy and will be interested in their Dove Mountain development. Mattamy Homes AZ has built over 650 homes since June 2013 in their Eastmark and Kenwood at Verrado communities in the Phoenix area. Their success in the Phoenix market opened the door to the Tucson Real Estate market and the Mattamy Homes At Dove Mountain community. In addition to the Mattamy Homes Dove Mountain development, Mattamy will be opening a development in Oro Valley AZ in mid-2016. This new Mattamy Homes AZ community will be on the east side of Rancho Vistoso Blvd. just north of the Hohokam Mesa subdivision. The Mattamy Dove Mountain subdivision is the first Tucson project for this prominent builder. Mattamy is the largest privately held home builder in North America. Their Dove Mountain development will offer great views, natural landscapes, and home features to meet buyer’s expectations. If you would like to know more about the Mattamy Home community in Dove Mountain give us a call 520 940 4541, we will be glad to answer your questions or get the information you need. Just looking for information about living in Tucson AZ or looking for that perfect place to retire too? We can help!